Okay, I was kidding about the steel toes, but not about the slippers. This is a construction site I passed today in Hiroo. Not taking off your shoes when you enter someone’s house here feels as weird as not taking off your clothes before you step in the shower, and that even goes for construction workers and delivery men. 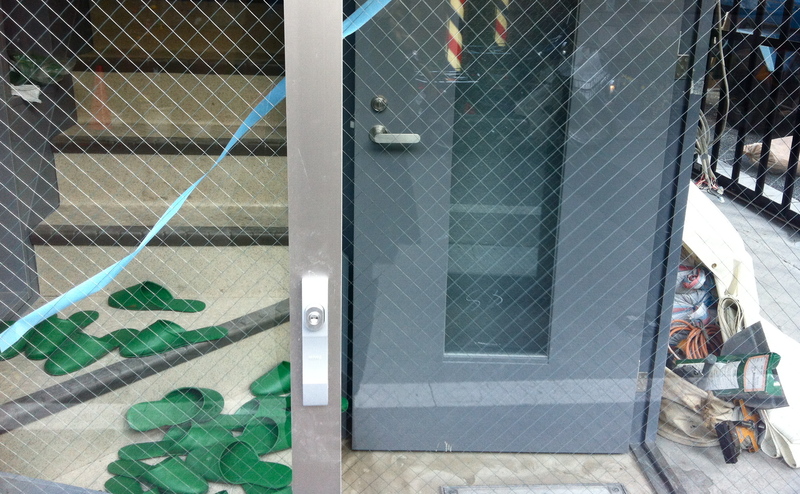 Two floors of this building are being renovated, and while the lower floor is still at the concrete stage (shoes okay), the slippers that have washed up at the bottom of the stairs like jellyfish at the high tide line suggest the upper floor has progressed to a more finished state. All day long, workers who move between the floors will exchange their shoes for these green slippers when they go upstairs, and put their shoes back on when they come down. Moving men have to do the same dance, but with furniture!